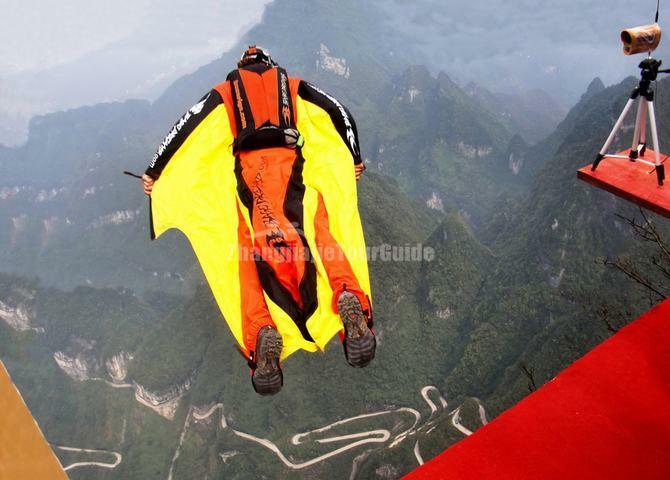 The Tianmen Mountain, a famous mountain first recorded in the history of Zhangjiajie, at an elevation of 1518.6 meters. It is located within the Tianmen Mountain National Forest Park, only 8 kilometers far from the downtown of Zhangjiajie City and is one of the most representative natural sceneries of Zhangjiajie. The Tianmen Mountain, literally translated as Heavenly Gate Mountain is so called because of a huge natural cave (Tianmen Cave) that occurs halfway up to the summit. For a long time, the mountain not only attracts the attention of the people by its miraculous and unique geographic landform and unparalleled natural landscape, but also well known for its profound cultural connotations and famous colorful humanistic sites. It is revered as the soul of culture and spirit of Zhangjiajie and reputed as Number One Miraculous Mountain in Western Hunan. The main body of Tianmen Mountain is uniquely skyscraping and domineering. Tianmen Cave the natural mountain-penetrating karst cave with the highest elevation in the world, hangs on the towering cliff. The cave becomes the unique sight under heaven and breeds the profound and grand Heaven Culture and Culture of Fairy Mountain in the local area. Tianmen Mountain is the second national forest park in Zhangjiajie. On the mountaintop are intact sub-primitive forests with overflowing wild atmosphere in all the seasons. In addition, the densely populated karst hillocks and karrens plus the mating of strange rocks and graceful trees create a grand garden of bonsai as if blessed by the God. Tianmen Mountain Temple, with an area of over 10000 square meters, enjoys a booming pilgrimage ever since the Ming Dynasty. It is the Buddhist center of Western Hunan. The six unresolved mysteries in the past hundreds of years such as Tianmen Cave, Shadow of Guigu, and Auspicious Unicorn have added the mysterious and elusive atmosphere for the Tianmen Mountain. The tourist traffic design of the Tianmen Mountain is worth the title of world-shocking masterpiece. It will bring shocking and unforgettable experiences for the tourists. Tianmen Mountain Cableway, Heaven-Linking Avenue, Tianmen Cave and Bonsai Garden in the Air are reputed as the four great wonders. Tianmen Mountain Cableway, the longest one-way recycling passenger cableway in the world, has a length of 7455 meters and a height gap of 1279 meters. It takes the tourists from the atmosphere of modern city directly to the hug of the primitive garden in the air. During the running of cableway, the landscape transforms into a kaleidoscope, making the tourists experience a miraculous feeling of flying angels in the sky as well as of being blended into a long grand painting of landscape. 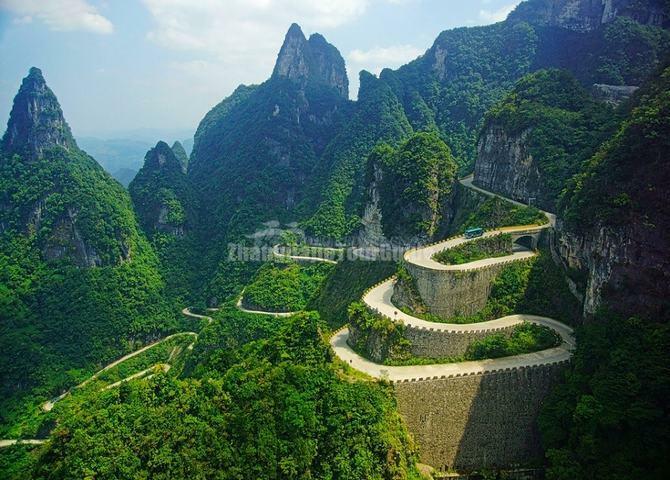 The mountain-winding highway of the Tianmen Mountain, nicknamed as Heaven-Linking Avenue, has a total length of less than 11 kilometers. Yet the elevation of it rises sharply from 200 meters to 1300 meters. The avenue rises steeply according to the form of mountain. The 99 blends link closely with each other and pile up in layers, making a pattern of a circling flying dragon reaching the skyline. Tourists marvel at it, which is worth the title of the Top Highway Wonder in the World.